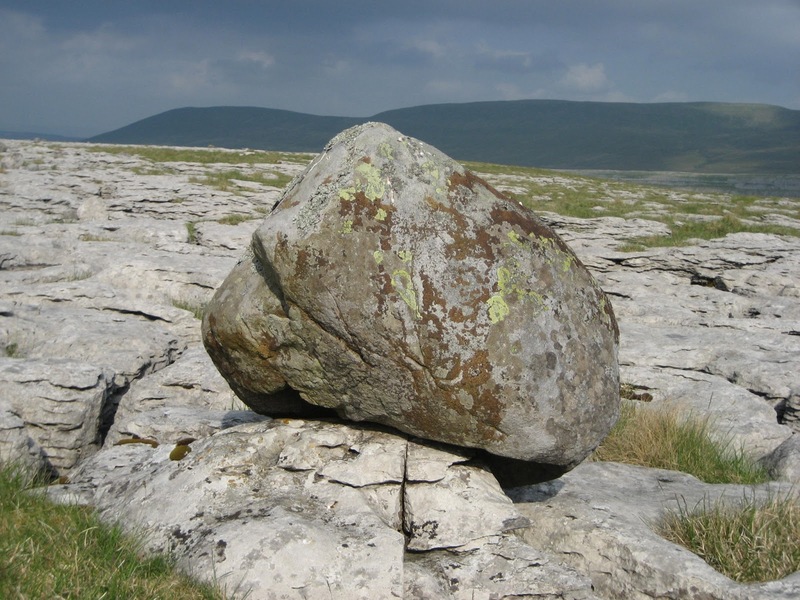 The striking erratic boulders resting on the pavements around Ingleborough are some of the most endearing features of the Dales landscape. So ‘out of place’ do these geological oddities appear that they draw the camera of even the most casual visitor. 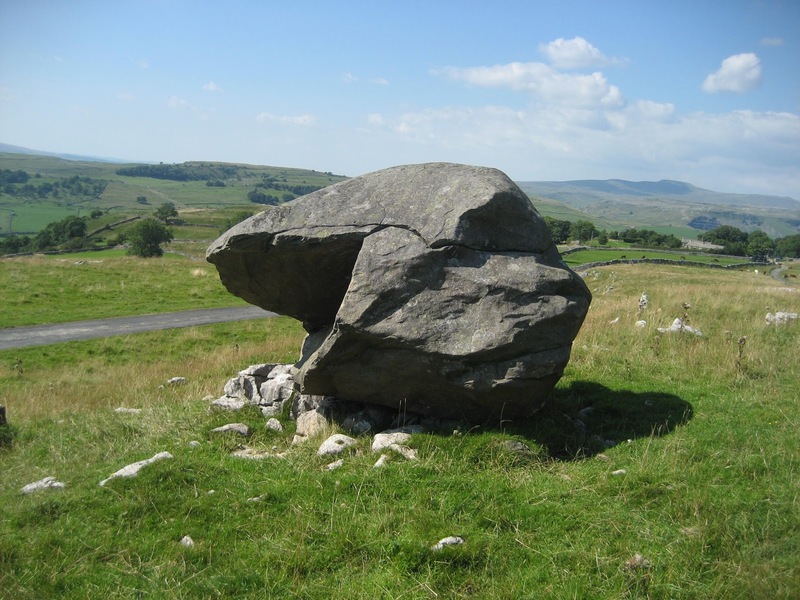 In simple terms, erratics are boulders scraped from the valley sides by moving ice and dumped at a new location – most notably on limestone pavements and benches. When the deposited rock is not limestone, the contrast is particularly stark and the contrasting hues in the opposing rocks make a superb subject for the photographer. However, even when the rocks are of the same type, it is quite obvious that the intruder does not ‘belong’ to the surrounding area. 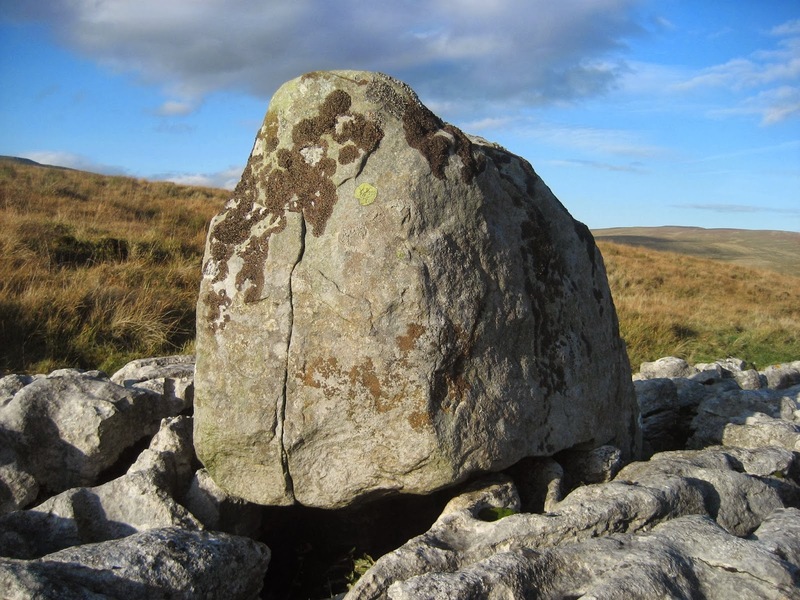 A fine example is the well-known ‘Obelisk’ – a huge egg-shaped limestone boulder on the pavements of Scales Moor, along the west side of Chapel-le-Dale. There are no surrounding areas of loose boulders from which it could have rolled, and it has obviously been dumped by the retreating ice, standing resolute through all the major events of world history. 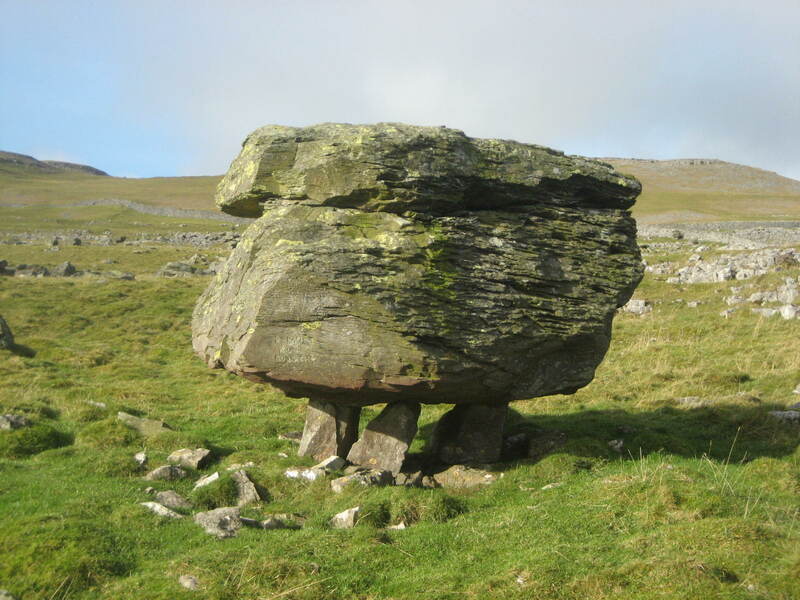 Similarly, the famous Cheese Press Stone (consisting of two huge limestone boulders) stands at the west shoulder of Kingsdale, on remnants of a once extensive limestone pavement; the great rocks having shielded the supports from sub-aerial erosion. Around the Obelisk are hundreds of smaller erratics, both of limestone and contrasting gritstone – and adding interest to an otherwise moon-like wasteland of bare rock. 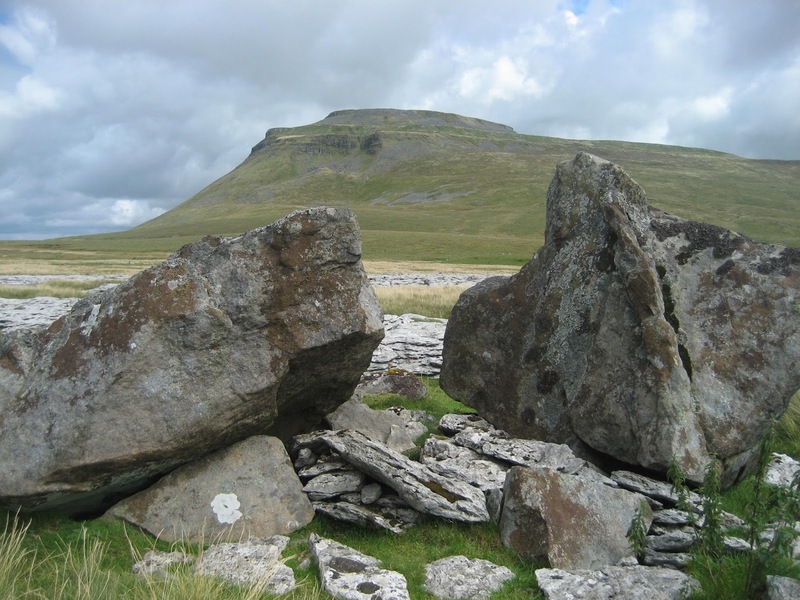 The Ribblesdale flank of Ingleborough contains several older erratics of Silurian origin, and good examples lie around Feizor and at Winskill Stones, to the north of Settle. Here, the massive greywacke boulder known as ‘Samson’s Toe’ sees splinters of rock (no doubt Samson’s ‘corns’) lying nearby, showing the effects of erosion on even the hard Silurian rock. Basking in glory as the most famous erratics in Britain, however, are the enigmatic Norber Boulders, close to the village of Austwick at the south-west tip of Crummackdale. Here, boulders of Silurian greywacke, which technically should lie below the limestone, rest in their hundreds on top of it – leading some to suspect that the glacier must have travelled uphill onto Norber Brow before depositing them. This can’t actually be proved, as the intricate folding and uplifting of the basement rocks in Crummackdale is such that at points the Silurian strata actually lie slightly above the younger rocks. The source of the boulders is clear on the north-west flank of the dale, and the ice has transported these only hundreds of metres, rather than a great distance. Nevertheless, these boulders remain a source of great debate to geologists for a number of reasons. Firstly, the most curious aspect of the Norber erratics is the fact that several huge blocks rest on ‘pedestals’ of limestone so small as to appear ridiculous – and it would seem only a push from an overweight sheep might dislodge them! 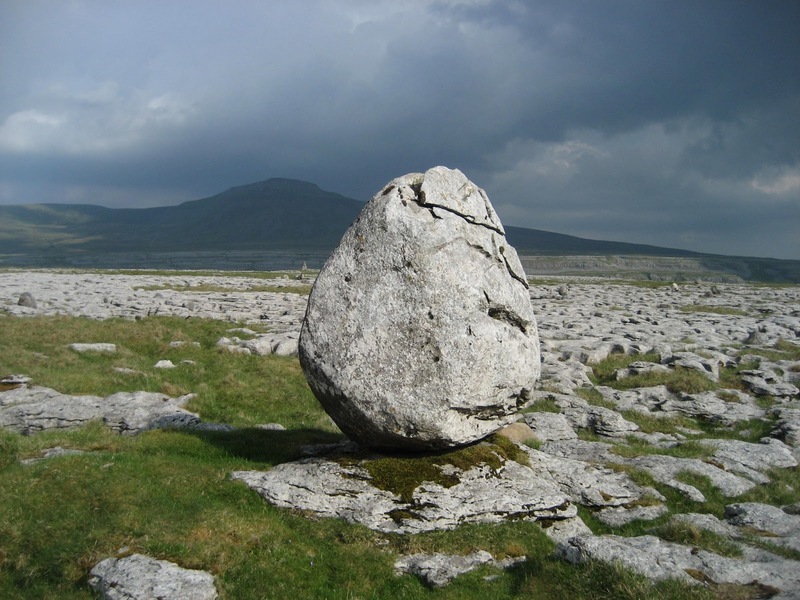 The idea put forward by Kendall and Wroot (1924) was that the boulders were deposited on a limestone pavement which, over the past 14,000 years has been eroded away by about 450mm. The pedestals, presumably, are remnants of the pavement protected from sub-aerial erosion by their boulder ‘umbrellas’. The 450mm assumption would mean an average lowering of about 30mm every thousand years, but this rate is much too high when compared with present day measurements of solution rates around the Dales. 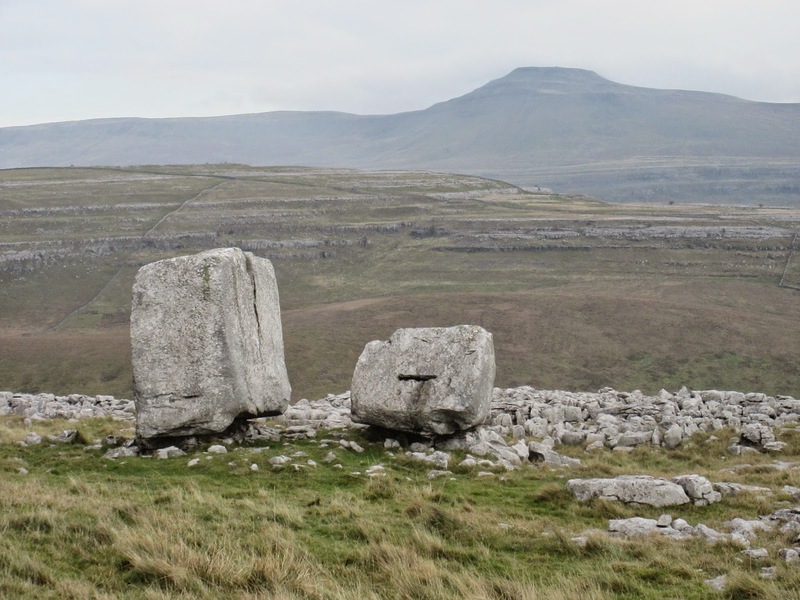 Work by Helen Goldie in 2005 suggested that only 200mm of limestone had actually been eroded away at Norber since the last glacial retreat, with the pedestal height suggesting the larger boulders may have arrived much earlier than was previously thought. 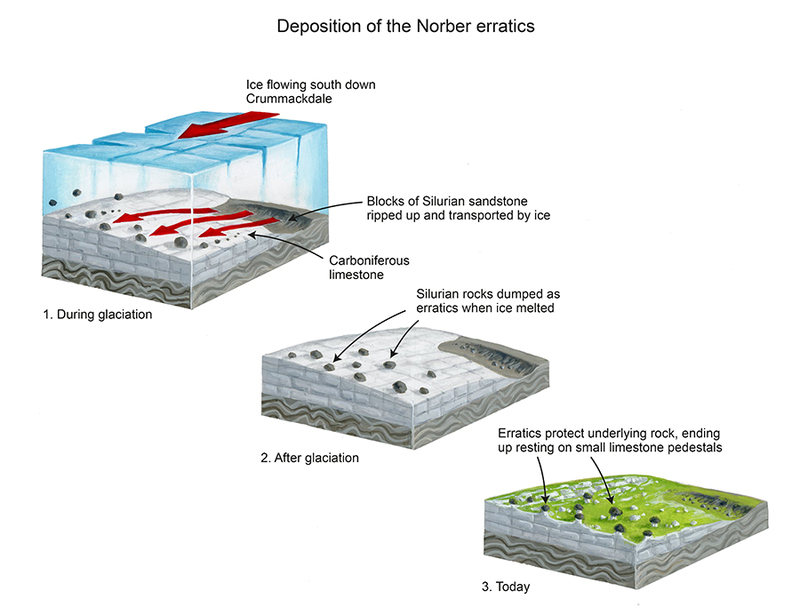 Secondly, nobody is sure whether or not the boulders at Norber arrived all at the same time, or in various stages during the Devensian glaciation. Clearly, there is still much to learn about these remarkable erratic oddities.